So it's all change round here once again. This Mama is now in full time paid work! But I'm incredibly lucky to have a fabulous job where I work from home with split hours so that I work around my kids and am still here for them as needed. Holidays are tricky, but they are great kids and we juggle life, and manage. So meals are simpler so that I can help the kids with their various after school needs - reading eggs, coding practice, home-learning, colouring, and more. I do judiciously use prepared ingredients a few times a week, the meals are still very reasonably priced and unprocessed; as good as from scratch, and healthy and nutritious. I don't feel guilty for helping myself with occasional shortcuts, and spending that saved time with my kids. 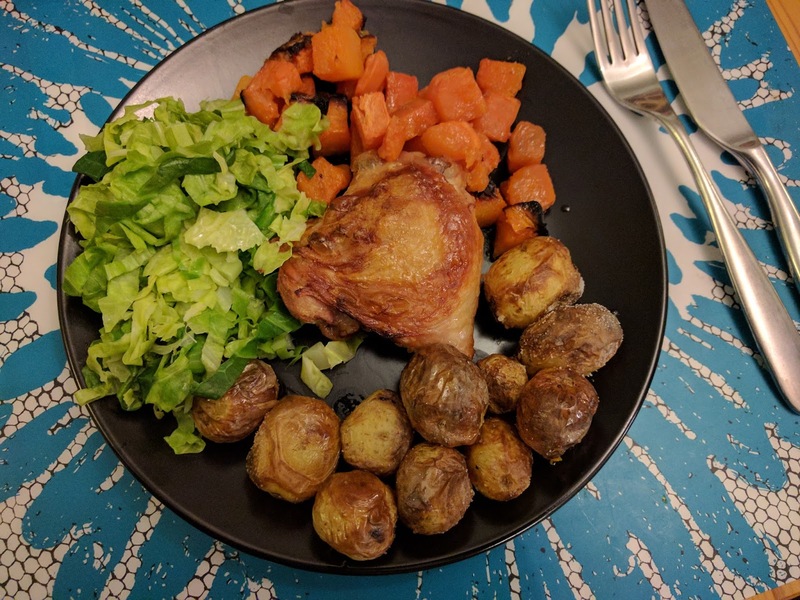 I have made this particular meal pretty much every week since I first tried it out, and it's a huge hit. It's so easy and tasty and low maintenance, try it out and I'm sure you'll add it to your regular list too. 1kg pack of chicken thighs, or a mix of drums and thighs, or leg portions would also be fine. 2 packs of ready prepped cubed sweet potatoes and butternut squash. Other prepped roasting veg would work too, or if you have more time to hand then feel free to peel and chop your own choice of veg. Some green veg as desired. Preheat your oven to 200 deg C.
Line a roasting tray with either a nonstick baking mat/silicone mat, or oil sprayed foil and spread the roasting veg over it. Season the chicken with the salt and pepper and place it skin side down onto the veg. Spray it all with the oil and pop it into the oven for 25 mins. 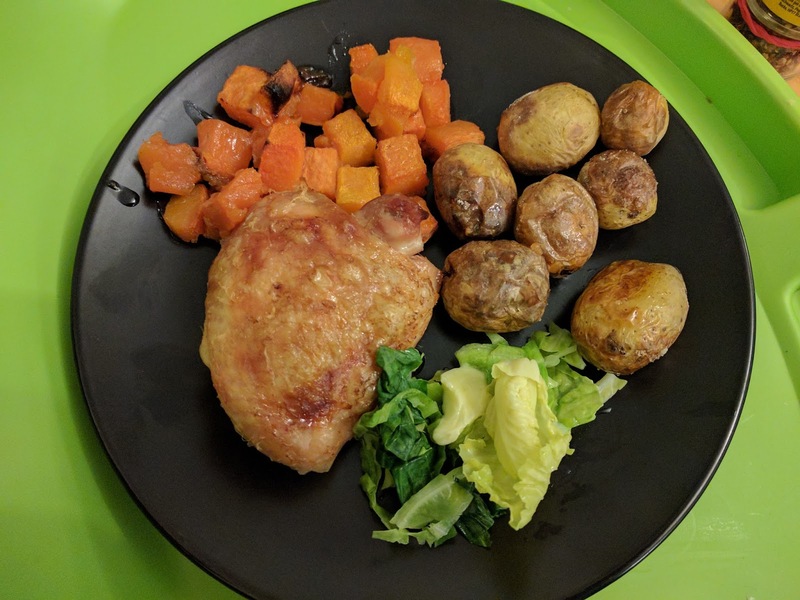 Now I use my halogen for the potatoes - I prep them the same way: spread on a foil lined tray, spray with olive oil and sprinkled with salt, then baked for about 20-25 mins in the halogen at 175 deg, but you could do them on a separate shelf in with the chicken for slightly longer. I don't try this as my oven is very old and variable and I don't think the potatoes would cook properly. After the first 25 mins, turn the chicken pieces over and shuffle the roasting veg if needed, and cook for another 20 mins or so until crispy and cooked through. Serve with the potatoes and the steamed green veg of choice.